For the past 2 years my school has had school-wide laminated paper hall passes - but this year our principal told us that we could make our own (which is awesome because those paper passes were coming back from the bathroom with wet spots - EW). 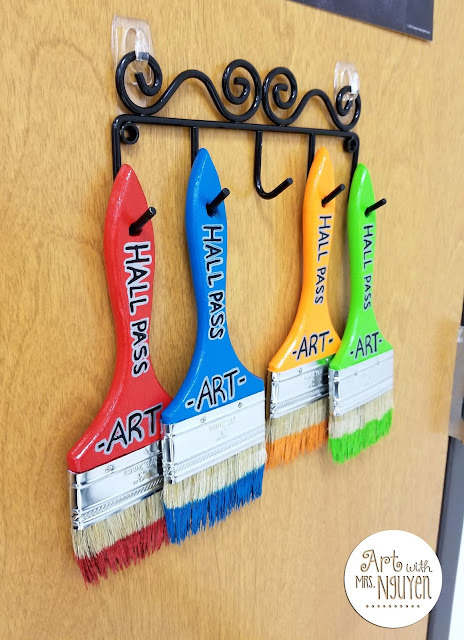 As she was presenting this information during our staff meeting, the PowerPoint she was showing happened to have an example picture of a hall pass on a paintbrush. Obviously I immediately fell in love! Once I got home I looked for some inspiration photos on Pinterest, and then got started! • Mod Podge (which for the past 20-something years I've been calling modge podge). I got started by applying painters tape along the edge of the paintbrush's handle. Then I sprayed the handles with a white primer spray paint that I had leftover from a previous project. 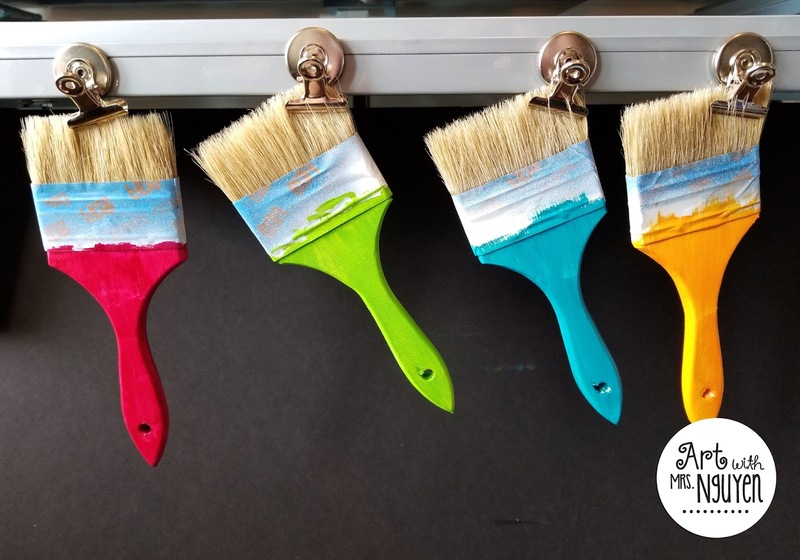 Once that was dry, I went ahead and painted the handles of the paintbrushes with acrylic paint. 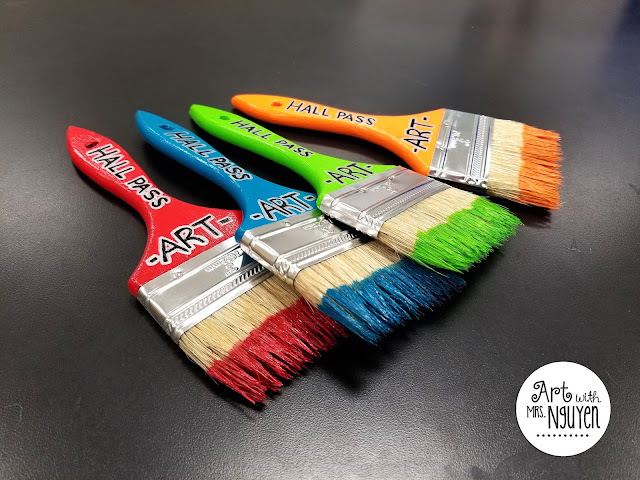 Being the impatient person that I am, I decided to paint both sides.. so to let them dry I used a clip magnet to hold the bristles and then hung them on the edge of my husband's metal drawing table. Once the first coat was dry, I realized that I really should have sanded them first (I was originally hoping that I wouldn't have to). So I went ahead and sanded them down and then painted a number of coats of acrylic paint over the freshly sanded handles. Once the handles were dry, I used a paintbrush to apply paint about halfway up the bristle side of the paintbrush. 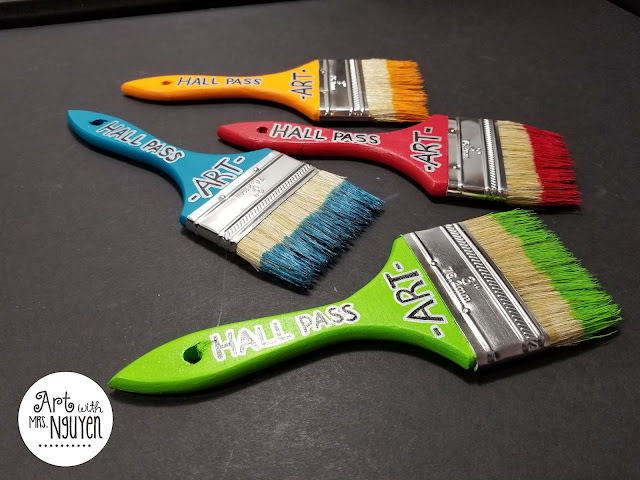 Once all the paint had dried, I used a black sharpie marker to write the words "Hall Pass" and "Art" on the handle. After tracing over that a couple times to thicken up the letters, I used a silver sharpie to outline around the letters. Once everything was fully dry, the last step was to apply mod podge. *VERY IMPORTANT! 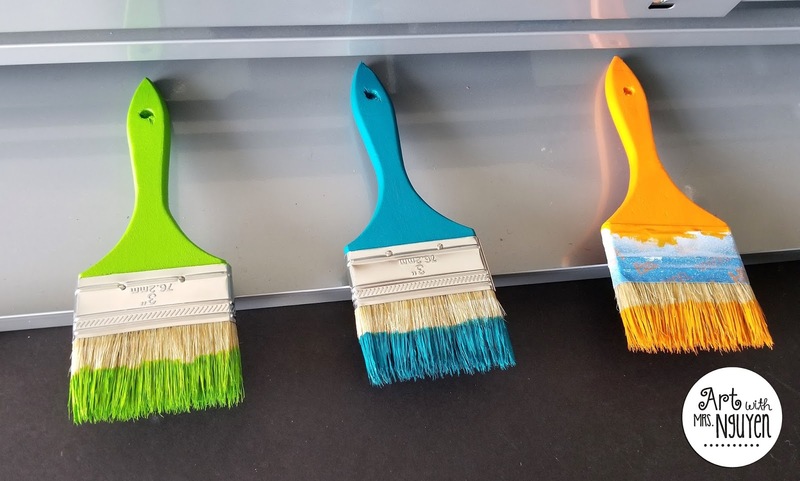 If you do not seal the handle, the paint will easily get chipped and dirtied. I used a glossy mod podge on the handle and then also added some overtop of the paint on the bristles to give the paint a wet look. 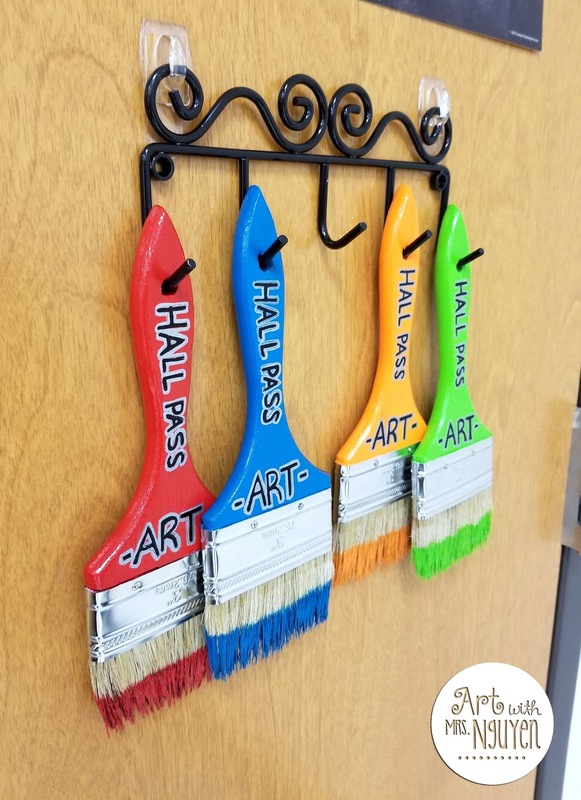 I got a relatively cheap key holder from Wal-Mart, spray painted it black, and now have my passes hanging up on the back of my classroom door. Both my students and I LOVE them! Such a simple fun project!